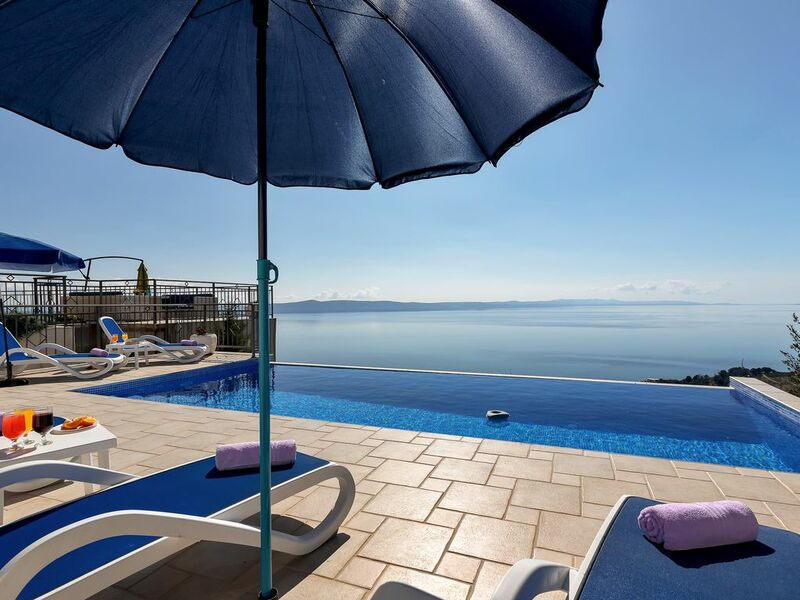 This villa is suitable for families and couples is set in the little ancient village of Podgora overlooking the adriatic sea. The brand new villa built and finished in 2013 is equipped with all modern equipment. It is 220 square metres which includes a ground floor with large living room, dining room, large kitchen, laundry with toilet. The 1st floor has 2 large bedrooms with bathrooms. The 2nd floor has the master bedroom with bathroom. All bedrooms have balcony with sea views from the bed. The outside has a fully equipped summer kitchen with wood and gas BBQ and sink. The large terrace wraps around the villa connecting the living and dining room, summer kitchen and infinity pool 30 square metres. cars. The sea views are beautiful. The villa is on 600 square metres of land. The villa has a Mediterranean garden with rosemary, lavender, and a lawn. All towns to look at are by car. Bathroom towels provided, also pool towels provided. Plasma TV 127 cm, also Satellite LCD TV in all bedrooms. Infinity pool 30 m2, 1,5 m deep. We were a family of 4 staying for a few nights on the Dalmatian coast. The Villa had the most spectacular views overlooking the Adriatic. My family and I experienced a wonderful vacation in this amazing spacious villa. It had everything that we needed. I loved it! View is amaising. Staying at this gorgeous villa was wonderful! The scenery alone was breath taking. Overlooking the alluring Adriatic Sea, this modern feeling home was a place I would definitely stay at in the future. It was spacious with three bedrooms which easily accommodated my large family. We enjoyed afternoon barbecues on the patio. In the evening my husband and I sat on the balcony and just soaked up the beautiful mountain and sea views! While very private, it is perfect for children and adults. Thank you Villa Lilly for an awesome experience!! Looking forward to a return visit! Fantastic place with a breathtaking view from the terrace and pool. We were 6 adults spending 1 week at this amazing house. Will love to come back one day. There is a nice outdoor grill and the house is in good shape with a new kitchen. The house, garden and pool area looks just as nice in real life as in the pictures. It was very clean and tidy, lavander flowers everywhere and the house is equiped with everything you need. The owner is a very nice and helpful man. Makarska can offer so many different things. The nature is spectacuar, and I will recommend the restaurant Veza in Gornji Tucepi 2 km from villa and Konoba Ranč in Tučepi. We had a lovely stay in this great spot. Stunning views. We had a great time dining out on the patio. Would highly recommend. we hope you come again you are always welcome. Hvar and Brac and the sea are in front of the villa. You are a quick 4 minute drive to beautiful pebble beaches in Podgora and many restaurants, ATM, boat rides, bars. The villa is 1 hour drive to Split, 2 hour drive to Dubrovnik, 20 minute drive to Drvenik which there is a boat ferry to Hvar, 8 minute drive to Makarska which there is a boat ferry to Brac. villa gives you beautiful sunset views and is for families and friends who are wanting to get away from the daily routine. This villa will give you the feeling of the perfect vacation. ruined villages all around and when you return to your villa the local food and wine will complete a wonderful day. The surrounding villas are beautiful like this one the answer is no.